Find a Discovery trip that explores Israel And Jordan. There are 29 tours to choose from, that range in length from 5 days up to 22 days. The most popular month for these tours is October, which has the most tour departures. "Nadir our tour guide was fantastic & he made the trip. 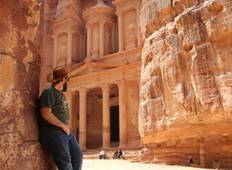 We did the 2 day trip to Jordan..."
"Hello, I ordered a tour, but I thought it would be bad. Prices seemed small for a..."
"So much to see and do. You do need to be relatively fit to get the most out of it...."
"Amir was an amazing guide by booking-tours we are extremely happy and satisfied by..."